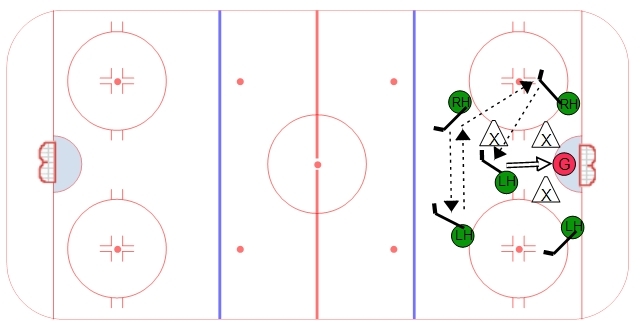 This 5 on 3 power play option places two players at the top of the box on their off-hand. This allows them to one-time the puck back and forth quicker. There are two players at the bottom of the box also on their off-hand which allow them to make one time passes and have their stick further outside the box. A player with a good shot and good scoring touch is placed in the middle of the box. The guiding principle of the power play is to move the puck quickly and take advantage of the penalty killers when they either have two players up high or two players down low. If two of the penalty killers get caught up high then they should move the puck down low to take advantage of the 3 on 1. If the puck is moved to one of the low players, they should look to make a quick pass to the back door, or to the shooter in the middle of the box. The other option is for the two player up top to keep moving closer to the net by moving the puck quickly. Once the shot is taken, all three players down low have to converge on the net. It is a good idea to get a few power play options for each situtation depending on the players you have available. Finding a good fit for your players and putting them in the right position to succeed is critical to their success.